I’ll be in Kiev this week to attend this important conference, and am happy that in addition to this event, we’re holding a special event for LabourStart correspondents from the region on Friday this week there as well. We have between 27 – 35 correspondents from Ukraine, Russia and elsewhere already signed up. And the conference organizers have even pulled together a LabourStart concert for Sunday evening featuring the Russian socialist band, Arkady Kos (details here). Expect a full report next week. Meanwhile, Edd has compiled a fantastic report which I’ve titled 10 Years of LabourStart campaigns in support of workers’ struggles in Russia, Kazakhstan, and Georgia – 2003-2013. By comparison, sales of our first book reached 377 after just 15 days. Sales of our second book reached 180 copies after just one week. So we’re selling the books considerably more slowly than we have in the past — instead of 25 books per day, less than 16 — a drop of nearly 40%. And our sales income will fall as well, as we’re not making any money on the Kindle sales. This is not unexpected — we anticipated that sales to our usual, trade union audience would be low and we still hope to develop a new audience for this book among people with an interest in new technology. Meanwhile, we’re waiting for Google to approve our ad for this book, and for the first reviews to appear. And we’re hoping to get a Spanish translation which would boost sales, as Firefox phones are selling very well in Latin America. What you can do: if you’ve bought the book and read it, please post your reviews to Amazon.com and let us know — we’ll publicize them. 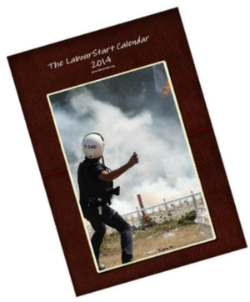 One of the problems with our new LabourStart calendar for 2014 is that people are unable to see the amazing photos we’ve collected to show there. When we point people directly to the Lulu.com website, they get very little sense of what’s available. When people see the actual calendar, as Derek has discovered in Canada this week, they’re blown away. We’ve been invited to speak at a national meeting of Steelworkers staff in Toronto in December. I think this is a result of this union having used us fairly frequently over the past couple of years and their apparently high level of satisfaction with the results. This is an important union here. I am very pleased at the invitation, especially so since it comes as a surprise. Order your copies today from CreateSpace — and in a week or so, from Amazon and elsewhere. 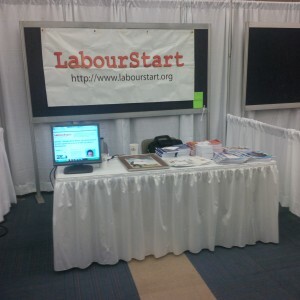 Derek Blackadder has set up a stall at the national convention of his union — the Canadian Union of Public Employees. It’s Monday morning and for the fourth week running, we’re launching a new campaign. This time, we’re helping the TUC-backed Justice for Colombia to campaign for the release of trade union leader Huber Ballesteros. Campaigns: We launched two new campaigns – in support of striking workers at Crown Holdings in Toronto, and in support of the Korean teachers’ and public service unions, threatened with deregistration by their government. The former is up to over 7,300 messages sent, and the latter, after just a couple of days, is already up to just under 6,800. Following the release of jailed Canadian trade unionist John Greyson in Egypt, we were able to close down the campaign. We also used one of our mass mailings to promote the IUF’s campaign in support of jailed independent trade unionists in China. The UN workers campaign, with nearly 14,000 messages sent, is our largest current campaign, and one of the largest we’ve ever done. 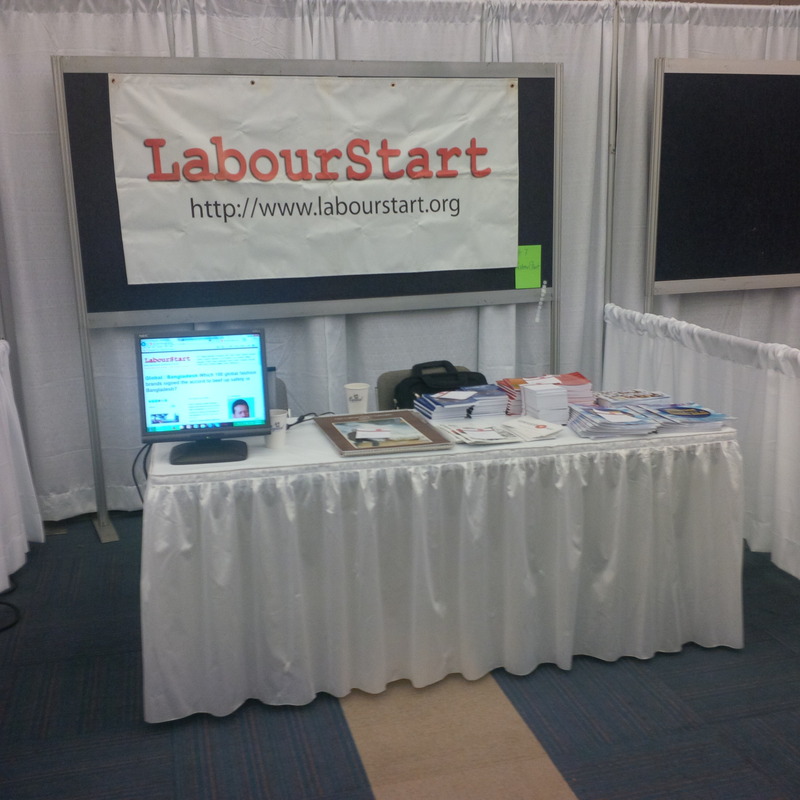 Calendar and Book Sales: In its first month, our LabourStart wall calendar for 2014 has sold 144 copies, an average of about five per day. I did another push this week which generated only two new sales in two days. Book sales totalled 1,664 as of earlier this week — with 959 of those being the campaigning book in English. 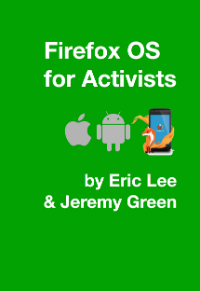 Book 3: Jeremy Green and I have completed a first draft of our book on Firefox OS for Activists. We’re making some final tweaks today and tomorrow and hope to have it ready on Monday. Public events: I spoke at the European Trade Union Institute seminar in Brussels on lobbying the institutions of the EU last week; the ETUI purchased 30 copies of our campaigning book. Last Saturday, I spoke to nearly 100 activists from UNISON Wales in Cardiff, and sold all 10 campaigning books I brought with me. Berlin 2014: While in Brussels, I had a chance to meet up with ITUC staff to discuss coordinating our efforts. In Berlin, meanwhile, we’ve set up a meeting at the Friedrich Ebert foundation for the day I arrive, later this month. Fundraising: I did the quarterly appeal to our power users, and the mailing this time reached 20,164. 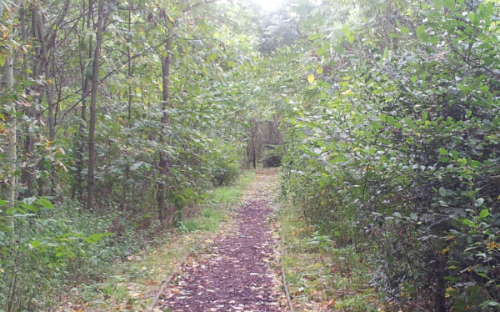 Ten days into the previous appeal, in July, we’d raised only £1,843.72. This time, we’ve raised £3,191.93 in the same period — a gain of 73%. Intern: We received about 40 applications for our internship; we’re completing the shortlist today and tomorrow and will do interviews within two weeks.